Shivani Varma has a slim and petite frame, and her big smile tells you she is an affable person. 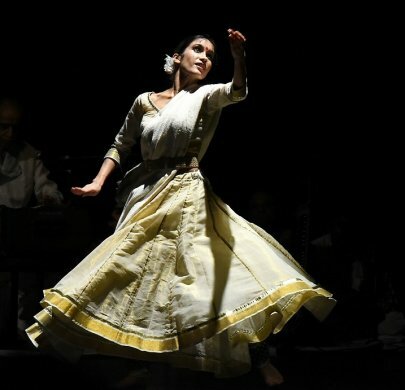 She performed at the India Habitat Centre, Delhi, on the 6th of March in a thematic production called 'Champaran Se Bapu,' her own choreography in Kathak. 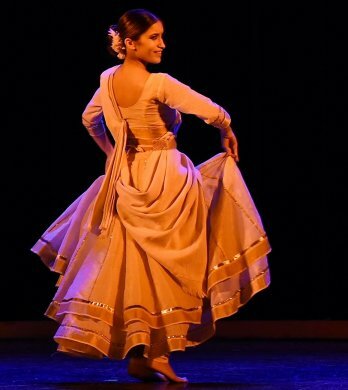 Shivani, a lawyer by profession, has learnt Kathak from Uma Sharma's academy and is a disciple of Shovana Narayan. She has performed in several solo and group presentations to critical acclaim. I recently started this exercise of listening to people who are working with the dancer and supporting her in the formation of her production. I'm calling this the Building Blocks series of interviews, in which artists explain how they contribute to constructing a production. The first thing that comes to mind is the concept of any production. Who develops the concept, gives it the conceptual framework? Who puts in that squiggly worm, or keeda, in the dancer's head to not just do a traditional piece, but make a production? Is the pure margam or pure dance piece not as enthralling to the audience? I think it is equally gripping. But a thematic performance is more captivating since it makes you relate to the performance as a person, and more so if it does not stray from its classical form. And of course, the dancer is always uncertain in such cases about the success of the production and the process of relating to the audience. So this is a conversation with Shivani, a young dancer, about a production she conceptualized herself. Let's start with the concept and the choreography. It was last year in September that Sukanya Bharat Ram approached me to do something on Gandhiji. She wanted to bring in a younger dancer to make it look fresh and more relevant to our times. The instinctive response was to do a production on the bhajans he liked, and she too suggested that. But that on its own is not exciting, that somebody would sing a bhajan and do choreography to it. No process of mind is involved in that - it would simply be a piece of craft. And then I thought of weaving a story around Gandhiji. But I did not want it to be a historical story because I could not convincingly be him. I thought what he stood for could be represented. I made a collection of the bhajans and made my story revolve around them - like he represented truth and non-violence. And then things started falling into place. The throng of the people when he arrives is shown by footwork. The train is like the footwork too, and then I had some vivid memories of the shots from the movie 'Gandhi', which I tried to depict. I introduced the shehnai since it heralds something good. It was done to show his arrival. After that was Vaishnav Jan Tho... In Kathak, we have invocation in the beginning, and then the technical part - tukdas, parans etc., and then the abhinaya piece. These days, the concept becomes important; otherwise you lose the interest of the audience. So my invocation was not to any god, but to the Father of the Nation and the values he stood for. Two pieces were about his values and the third was about the Partition. I did not want it to be all sad and rona-dhona. My whole family migrated from Pakistan and my grandfather would tell us those stories. People never thought they were not coming back. They buried their belongings there. My grandfather lost his sister in one of the refugee camps. Many of his Muslim friends helped him. All of these stories were my backdrop. I wanted the feeling to be there, but not make it very personal. For Gandhiji, it was like cutting him up into pieces, since he was very against Partition. Annamalai-ji and Sukanya aunty who were guiding me, said that he was not even consulted even though he was a very big part of the movement. (A. Annamalai is the director of the National Gandhi Museum at Rajghat. Sukanya Bharat Ram is the great-granddaughter of Mahatma Gandhi and also the Pratindhi of the Kasturba Trust in Delhi). In the end, he was questioning non-violence, because he saw so much violence. I wanted to mirror that feeling of his, like lines are being drawn, like he is being cut up. People were being displaced and they never knew the line would cut through their houses. That part I wanted to portray and I read about Radcliff. He was arrogant and had no idea about the task he was given, for which he was given just 7 weeks. He knew there would be a lot of bloodshed. He did not even collect his salary for the task. He just ran out of time. In some ways, the cultural upheaval, divide and rule, the discrimination of castes, are largely political. These were the thoughts that I tried to bring out. And it's more acceptance that you want to show. Two generations down the line, nobody is missing the other side. My feelings are those of patriotism. 'Vande Mataram' and 'Saare Jahan Se Achha' give me goose bumps, and I wanted to marry the two.These were two controversial songs of their times. One is in Urdu and the other is in Sanskrit. Iqbal was a patriot and he became a fanatic. He sided with Jinnah, but the two songs say the same thing in their own way. The rivers, the mountains, the diversity - these are the things that define us. This is what we are. And today, we are so anglicised that we all speak English. I have used all the languages -Gujarati, Hindi, Bengali, Urdu, Sanskrit. Gandhiji was secular, and he died for it because people thought that he was on the other side. He was completely divorced from all that. I wanted to identify with that feeling. I wanted it to be a celebration of our nationality. 'Lead kindly light,' Gandhiji has spoken about this hymn. The words are so beautiful and meaningful. And I wanted the audience to come forth with their candles.The costume had to be simple, so I used white khadi.The dance with the ribbon was meant to show the entangled struggle, tying and untying him and cutting him. He was helpless in all of this. How did it blend into your style of dancing? The music is by Pt. Jwala Prasad and when he sings, I don't have to choreograph the songs. It just comes naturally to me. So the bhajans were easy to choreograph. It is only in 'Vande Mataram' that a tarana has been woven in. So Jwalaji asked me to make it clear that the music for this has not been composed by him, but arranged and conducted. I wanted both 'Vande Mataram' and 'Saare Jaahan Se Achha' as tarana without a break. It had to be one thread giving equal weightage to both. Rhythm has been done by Yogesh Gangani and Mahavir Gangani. For the Partition piece, I told them that I want only aalap, padhant and the steps, which created a wonderful effect. Technical pieces had a jugalbandi which was not a sawal-jawab (question-answer), but a moohtodjawab (retort) or a clash. I had gat, thaat, tihai, paran, tukda- all the elements of Kathak. I put in the three monkeys, and in 'Vaishnav Jana Tho' as he asks us to respect women, I depicted the Nirbhaya episode. I tried to encapsulate more or less all aspects.